The HTC One mini 2 has just gotten official, and it’s an all-around nice upgrade from the original HTC One mini, but how does it compare against the competition? First, let’s talk about the specs of the One mini 2 itself. Under its gorgeous aluminum hood lies a Qualcomm Snapdragon 400 system chip with a quad-core Cortex-A7-based processor running at up to 1.2GHz along with 1GB of RAM. The Snapdragon 400 system chip lies right in the mid-range, it’s a farcry from the top performing 800 series, but it’s surprisingly decently snappy and will run even more intense games (but with less detail). The competition? We looked for the two other important Snapdragon 400 devices out there - the Motorola Moto G and the LG G2 mini. The Moto G is one of Motorola’s biggest successes in recent years, since it packs such good hardware at an extremely affordable price. In pure specs, it’s completely on par with the one mini 2, but in price the difference should be huge. Then comes the LG G2 mini. The Snapdragon 400-powered LG has the same chip, but a disappointingly low-res display - its 4.5” screen is of qHD (540 x 960-pixel) resolution only. The next hugely important factor in specs is the camera. 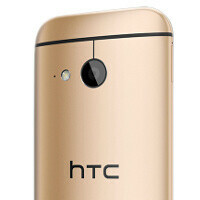 Gone are the UltraPixels from the HTC One (M8), and gone is the Duo camera. Instead, HTC goes with a very sensible, high-res 13-meagpixel camera with a BSI sensor and an f/2.2 lens on top. You’ll see what the competition brings in the table right below, but before we leave you with it, it’s worth mentioning that the HTC One mini 2 also packs dual speakers on the front. This is a bonus no other mid-range phone delivers, and it’s also to remind you that not all can be seen in specs. But a lot can, and that’s why you should see who wins in this cold-blooded spec battle right below. LG G2 Mini a fail. The only worthy of the name mini is the Z1 compact, a mini sized flagship when it comes to it's specs. Aside from pixel density how is it a fail? Good job HTC. Best all around mini version available. I'd love to see a camera comparison between the HTC Mini and the M8. I bet HTC purposely makes the pictures crappy on the mini, so it can justify their crappy "ultra-pixel" nonsense camera. Seems like a good option to try in the coming future.